Known as one of the most popular chicken breeds, Silkie chicken’s odd features – specific to their breed – are what makes them such great pets. Before you add these lovely fluffy butts to your flock, there might be some questions you have. In this article, I share 8 Silkie chicken facts that’ll help you decide if this breed is for you. Let’s take a look at this several unique characteristics that makes them different among other breeds of chickens. Fact #5: Silkie hens tend to naturally “go broody” than other chicken breeds. Fact# 6: Silkies have a “puff ball” on their heads that’s also a genetic anomaly. Fact #7: Silkies are smaller in size and weight as compare to other traditional types of chickens. 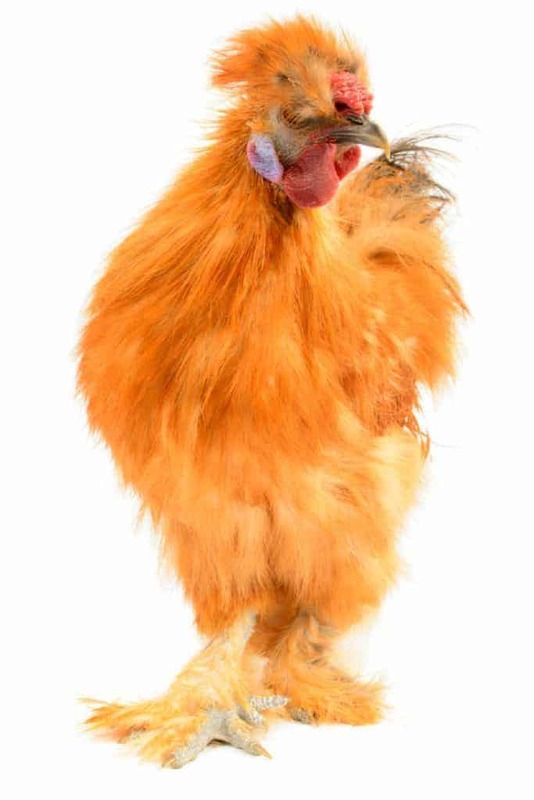 Fact #8: Silkies can’t really roost because they can’t fly up like other chickens. Silkies are known for their unique genetic twist which gives them an additional 1 or 2 toes per foot. While most types of chickens have 4 toes, silkie chickens have 5 or even 6! While not “normal,” the extra toe certainly is cute! It also makes it easy to spot silkies at your local farm store during Chick Days. The extra toes don’t serve any evolution or survival function, and no one is really sure how the breed ended up with some extra digits. This unusual feature is referred to as melanism (development of the dark-colored pigment melanin in the skin, an opposite of albinism) which goes beyond the skin, penetrating the bird’s connective tissue. Although they aren’t entirely black like Ayam Cemanis, the blue skin still is super cool! While their fur-like feathers are different from other chickens, it’s super soft and very fluffy to touch. In fact, while the feathers don’t provide much protection from the cold, they DO make the silkie a great choice for a pet chicken since children adore the fine feathers that resemble the down on chicks. So, why are silkie feathers so different? Well, the feathers lack barbicels (minute cartilage hooks that holds each strand down), so the feathers fly freely. And yes, it makes these chickens very soft and fluffy and adorable! This isn’t to say they NEVER crow….but they’re pretty quiet. This makes Silkie roosters ideal for urban farms, where your neighbors might object to the noise. As for their temperament, the roosters tend to be naturally more calm and don’t make loud noises when they’re startled (unlike other roosters, which will crow loudly at the slightest leaf shaking), making them a less disturbance in your neighborhood. The roosters also tend not to attack humans, unlike other breeds, which can flog you when provoked. In fact, silkie chickens are more likely to run away! Silkie hens are more likely to want to sit on eggs than other breeds, which makes them perfect for your farm….if you want to naturally hatch chicken eggs, that is. Most of the time silkie hens are friendly and loveable, but when they sit on eggs, the chickens can turn into fierce mothers who guard their nests closely. This is a good thing! While other types of chickens tend to abandon nests, a silkie hen is more likely to stay on her eggs until they hatch, and guard her chicks so they grow up healthy. Though they aren’t the champion egg layers of the backyard chicken world – most silkies only lay eggs about 3 times a week – broody hens will hatch their own eggs, other chicken eggs, duck eggs, and even turkey eggs! Imagine how nice it would be to see a Silkie hen raising baby ducks, geese, and even turkeys! Some Silkies have a crest or “topknot” that gives them an adorable “puff ball” of feathers on top of their heads. It’s more prominent on Silkies that have a vaulted skull. Silkies that have these poofy feathers sometimes find it hard to see because of their crest. However, this is easily solved by gently trimming the feathers away from the Silkie’s eyes. They are lightweight and only weigh about 2-3 pounds, which makes these chickens great for children. Silkies don’t really have flight feathers, so it’s hard for them to fly up into roosts. The best they can do is kind of hop upwards until they get to their destination. They still like to sleep off the ground, so you can stack hay bales or blocks of wood so they have a safe place to rest at night. Have we missed any Silkie chicken facts? Although Silkie chickens may be different in one way or another from other breeds, one thing is for sure, they make an excellent pets! 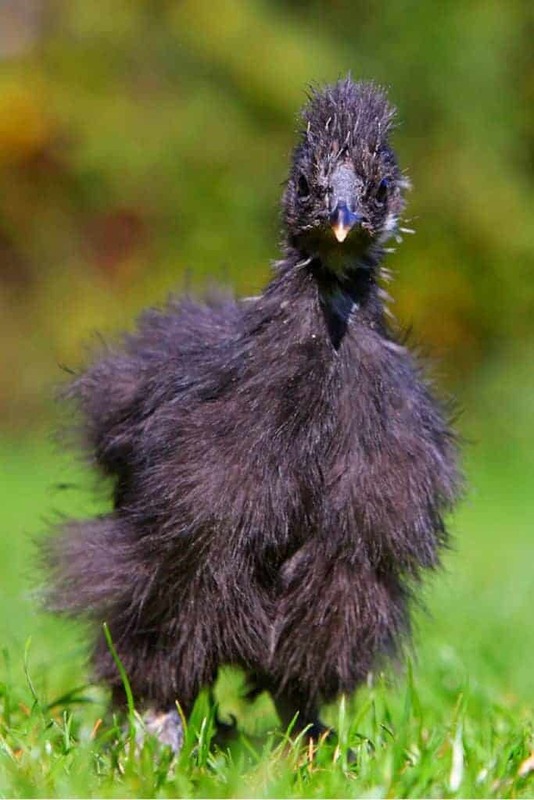 Overall, these peculiar little Silkie chicken creatures gives so much joy and pleasure to their owners! My silkie roosters crow like crazy. It could be because I have other roosters and they are competing. One even runs around and lets out a scream that sounds like tarzan! He is very sweet though! It’s possible! I always seem to get the quiet chickens, too! This is such a great article! Silkie’s are the best! Thank you! !